Many people don't make the most of their high definition TVs and expensive DVD players because setting up surround sound systems is seen as a complicated task. Sony thinks it has the answer. 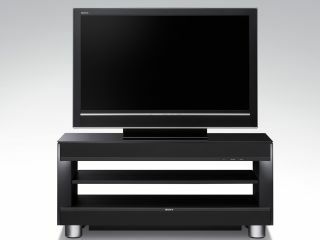 It's introducing the RHT-G800, a TV stand which acts like a home cinema dock. It works just like an iPod dock, hooking your MP3 player up to your computer, speakers and power without you having to fiddle around unnecessarily. Under the TV stand's touch-panel control it has a complete surround sound system, containing all the speakers needed to fill your whole room with the atmosphere of everything you watch. It's all pre-installed and connected for you, so there's no need to worry about fitting multiple speakers or dealing with any wiring. All you have to do is place your TV on the stand, put your other devices - like your digital TV box and DVD player - on the shelves provided, and connect them with cables hidden away in the structure of the G800. Switch on, and you have instant home cinema, with surround sound. The technology is called S-Force PRO Front Surround. Of it, Sony says: "It's an amazing effect - it sounds like you're surrounded with speakers, and yet there's none of the usual wiring all round the room. And it works in every room - whatever its size and shape." Sony hopes it has also dealt with the problem of annoying your neighbours will loud bass. Its engineers have designed special vibration-cancelling technology, ensuring that while you get rich, powerful bass, much less of it escapes through the structure of the unit into walls and floors. The Sony RHT-G800 is available from May. No pricing is yet available.